George Brodie was the fourth son of the late Sqn-Sgt-Maj J and Mrs Brodie of Woodbury, Highfield Road. George attended Malvern Link C E School and the Lyttelton Grammar School. He grew up in a military household; his father was for many years the instructor of the Malvern Squadron of the Worcestershire Yeomanry and before the war began his three older brothers, Hugh, John and Norman were all serving in the Yeomanry. At the outbreak of war he was working on the reporting staff of the Worcester Daily Times. He tried to enlist to join his brothers, but was turned down on medical grounds. 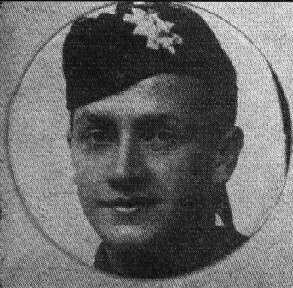 Undeterred he travelled to Perth and joined the Black Watch in May 1915. He went out to France and first went into the trenches in November 1915 (he wrote about this for the Malvern News). In September 1916, Brodie was wounded and invalided home, and some time in a London hospital. During this time he applied for a commission and was accepted. At this time the shortage of junior officers was such that many men with a grammar school education were encouraged to offer themselves as officers. In May 1917, after six months training he was gazetted as a Temporary Second Lieutenant and was attached to the 8th Battalion, The Seaforth Highlanders. He had been in France for about two months when, during an attack on the German lines he had to take command of his company, (more senior officers being killed or wounded). He realised the situation was critical and, without waiting for orders, moved his men forward. Just before the tide turned in the British force’s favour, he was badly wounded by a German bullet. Despite efforts made at the field ambulance he died. L/Cpl G Brodie went to the front on the and relates his first experience of the trenches: “…though short, it was quite long enough. We crawled in on Tuesday. I should think the trenches are almost at their worst now. The mud and slush are beastly and we had to walk several miles through a labyrinth of dirt. It was an unfortunate start. We had hardly realised that we were under fire, and kept popping our heads up freely. Part of the battalion went into the first line trenches and our part was in the support trenches. The trench which I was in was an old German one – not in the best condition. There were one or two dugouts, but mine was just a hole in the side of the trench. By lying with my knees well up could get into it, but if I wanted to lie full length, my feet had to go outside. I was in charge of a guard. It was a wet, cold job but it suited me fine rather than sleeping in my dugout. I spent most of the time walking up and down to keep warm and watching the rates; whose forms were silhouetted in an almost constant procession across a sort of a bridge which spanned the trench. As far mice, there were hundreds knocking about. Just before dinner on Wednesday. I was warned with one or two others to parade at HQ. It turned out that we were to be sent back to — (the place where we were billeted with cows and things) to go to a bombing course and here we are. I was rather relieved to be out of the trenches for a bit and it was a treat to have a sleep in a dry billet (we are in quite a decent barn). The journey from the trench was rotted. We had a good seven miles to go, mostly through the trench – I cursed my pack before the end of the first! We were crossing a bit of open country, when the Germans spotted us and sent a few shells after us. They were much too close to be pleasant and we had to stay under cover until it began to get dark. We left the trench about 1.30pm and arrived here just before 9pm, packs on the whole way. His mother received a letter from the Lieut-Colonel of George’s Battalion, dated 5th August: “It is with the deepest sympathy that I write to you of your son’s death in action. At the commencement of the attack he was commanding his platoon; later on, as a result of officer casualties, he was in command of his Company. On the afternoon of the following day the Germans made a strong attack on our new position. Your son’s Company was in support, and without waiting for orders he quite rightly moved his men forward to the front line , where his men assisted very largely in driving the enemy back in disorder. Just before the tide turned in our favour, your son was wounded by a German bullet, and he was forced to go back to Battalion Headquarters. From there he was taken to a dressing, where he succumbed. Those who saw him say that he was cheerful and not suffering great pain. We buried him in the military cemetery. Of his three older brothers, Hugh, died in England aged 28 on 25th May 1916 and was buried at St Matthias Churchyard. Regimental Sergeant-Major John Kinsman Brodie served at Gallipoli and in Egypt, and was present at the Battle of Qatia. He was awarded the Serbian Cross of St George and was mentioned in despatches. He was severely wounded on the 9/1/17 and was invalided home in March 1917. Having sufficiently recovered, he was commissioned into the 5th Reserve Cavalry Regiment in August 1918. Norman Brodie joined the Worcestershire Yeomanry in October 1911, aged 18 years. He served at Gallipoli and in Egypt and was twice mentioned in despatches – after three years of war he promoted to Squadron Sergeant Major. Discharged in 1919, Brodie joined the North Rhodesia Police, culminating his long and distinguished career with the award of his Meritorious Service Medal in 1945 and a successful contribution towards the Royal Visit of 1947. He finally retired as a Superintendent of Police in 1950.